American Express over the weekend released a new advertisement called "Retrospective" that promotes how its timeless safety and security are now available through Apple Pay. The 30-second spot takes a trip down memory lane as it recounts the brand's historic past, starring a number of famous cardholders such as Jerry Seinfeld and Tina Fey in both the past and present. The advertisement first aired during the mid-season premiere of The Walking Dead on Sunday night and will also be featured during the NBA All-Star Game later this week. American Express does not provide an exact number of Apple Pay signups, but Ad Age reports that the credit company has received "encouraging feedback" from early iPhone 6 and iPhone 6 Plus adopters. Apple Pay makes up two of every three contactless payments on Visa, MasterCard and American Express, while an additional 750 banks and credit unions have signed on to support the iPhone-based service. Apple Pay is currently limited to the United States, although an international rollout could start with Canada in March. Ever since I registered my Amex card with Apple Pay, I now receive instant notifications of all purchases on that card. This not only occurs for purchases using the NFC feature of the phone, but the notifications also appear when the card is swiped in the old way. One example: when a restaurant server takes my card away and swipes it, the charge notification instantly appears on my phone - before the server returns to the table with the card and charge slip. The phone was not used to make the charge -- the card was swiped in an old magnetic-swipe device. This notification is awesome, and is a great security feature. Interestingly, this instant notification feature (for non-iPhone transactions) does not appear for two other cards that are registered on Apple Pay - only the Amex card has this feature. This feature is so useful that It surprises me that Amex does not advertise it. Frankly, all cards should work this way. Wouldn't everyone want to know instantly whenever your credit card us used for a transaction? 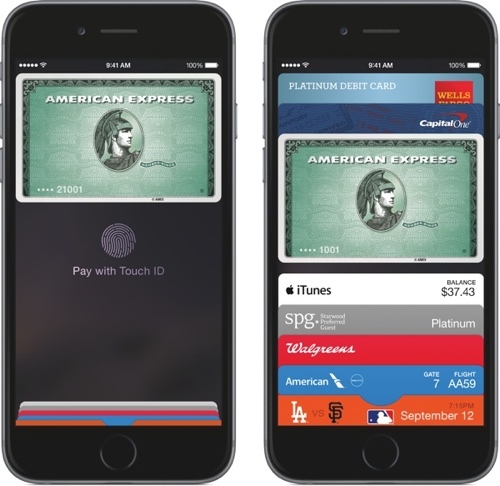 You guys keep saying that apple pay makes up two of every three contactless payments, but this is not true. That is not what the original quote says. He says that apple pay accounts for $2 of every $3 of contactless payments. These are not the same thing. If every apple pay sale is for $1,000 and every other contactless payment is for $1 then the difference could be significant. Please stop asserting this. This is way better than the ad Apple released today. I use Apple Pay wherever I can. But in places that don't yet accept Apple Pay (iPhone payment), I use my AmEx and I absolutely LOVE how I instantly get notified (on my iPhone 6) when a purchase is made with AmEx. Even if I order something on the web, the instant my card is charged I get a notification on my iPhone telling me about the charge. If my AmEx number is ever compromised/stolen, I'll know about it at the same instant the thief is still standing at the register trying to use my card. It's my understanding that most other credit card companies are not as quick with the notifications as AmEx. Therefore, AmEx is the ONLY card I use with Passbook/Apple Pay. If I can't use Apple Pay or AmEx to pay, I pay cash! This is based on the card issuer, not the card network. There are Visa and Mastercard issuers (aka: banks,) that do this also. It's not even ApplePay specific, it's just that ApplePay is what got you to enable it on your Amex. It's a great feature--but far from "new". Probably why it isn't advertised. I get these notifications for all my cards. They used to be just emails, now they are push alerts (better IMO). And this ad is great. I forgot about Seinfeld hocking the Amex cards.